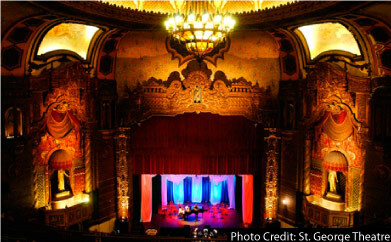 Part of a major NYC restoration project, the historic St. George Theatre in Staten Island has been restored to its glory. Originally built in the 1920s, the magnificent vaudeville theatre features both Italian and Spanish Baroque styles in its architecture, with intricate murals, tiled fountains, and sculptures displayed throughout the theatre. Since its reopening in 2004, the theatre has hosted more than 400 events, and seen over 500,000 patrons walk its red carpet. Famous guests include Tony Bennett, Art Garfunkel, Wayne Newtown, Yolanda Adams, and more. The historical arts and culture center is currently used as a venue for special events, and live performances such as Joan Rivers' one-woman show and "Dora the Explorer Live!". Parking.com offers convenient parking near the St. George Theatre. Click on the location name for parking details or to print parking information. Nearby attractions include: St. George Historic District, Staten Island Sept. 11 Memorial, National Lighthouse Museum, and the Staten Island Institute of Arts and Sciences.